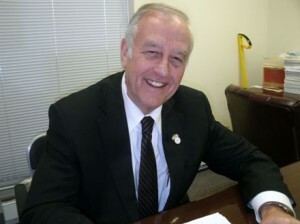 Davenport Mayor Bill Gluba changed hats last night and voted in the Electoral College. The Iowa elector from the state’s 2nd congressional district was among 538 electors nationwide to cast the official ballots for president and vice president. Gluba called it “a great honor” to vote for Barack Obama and Joe Biden at the state capitol in Des Moines. He says the founding fathers knew what they were doing when they created the electoral college for the United States, which is not a “pure” democracy. Gluba says he first met the president in former Illinois Congressman Phil Hare’s basement, when Obama was running for the U-S Senate. In 2008, the mayor also helped develop the Obama campaign strategy for Iowa. As an elector, Gluba will receive two tickets to the inauguration next month. He says having a reserved seat will be a lot better than standing far in the back, like he did four years ago.